Multi line connection and Port, a little help please? 1. Keep my 7300 number as the DSL, fax and credit card machine are on it. I can downgrade my phone co service to $ 24 a month + $ 40 for internet. 2. Port my 7101 number to ooma and then cancel my phone co service for 7101. I will use multiple cordless phones connected to ooma for my 7101 incoming and outgoing calls. Does this sound feasible? Any confirmation would be greatly appreciated. Thank you in advance. Re: Multi line connection and Port, a little help please? The most important issue here is your billing: do your two number have the same billing statement or each have its own? If they have the same billing, which one is the primary number? If your 7101 is your primary number, when your port it, every thing on its billing statement will be lost/cancel. Oh Oh. I guess I should call ATT to change the billing to the 7300 number. As you said, the 7101 number is the primary billing number. When ATT ports to ooma, they will cancel the 7300, I won't have DSL and I will be out of business. Thank you for your assistance. I will call ATT now. Thanks for your suggestions, ATT business office is closed right now. I hope they don't give me trouble. No idea why this is. 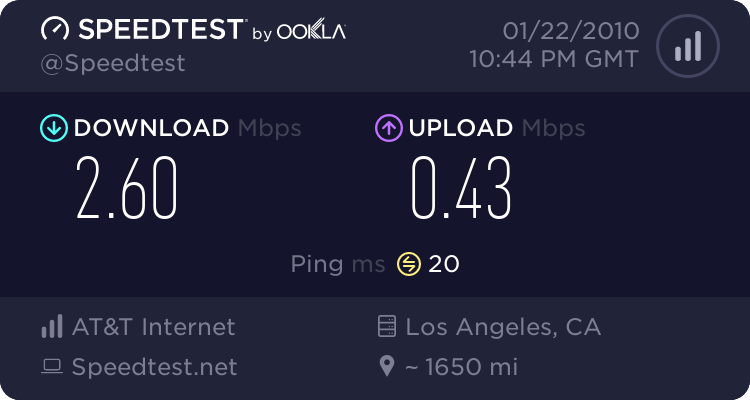 My speed test is below, but is this enough to run the VOIP? Please help. I'm not really sure what else to do from here. tedsto wrote: I can't make outgoing calls. Incoming is perfect and voicemail is perfect. When I dial out, I get a clear ooma dial tone, dial the number, hear a click, but never any ringing. The other party's phone rings, they can answer, but I don't hear them, they hear me. I have tried hard reset, reboot of modem/router followed by ooma reboot after stabilization, and disconnecting everything from hub. I have ATT, 2 wire modem/router, then ooma. Download speed is 2.58b and upload is .43 mb. I spent 2 hours with customer service and they had me reboot repeatedly. My ticket number is CS 27571. I have called various numbers, Verizon cell phones, 800 numbers and Ooma, same results all the time. It looks like the nature of your problem changed since you started this thread, and while you changed the subject of the post it did not show in the OP subject, so unless someone read through your thread titled "Multi line connection and Port, a little help please? ", they would not know that your problem now was "outgoing call problems". Since you've already decided to return your equipment I guess it's too late to try to help, but I do have one question regarding Costco - I thought they did not have a return time limit, has Costco's policy changed? Thanks for the response. About a year or two ago they instituted a 60 day return policy on electronics. I am not sure what constitutes electronics, but it appears to be cameras, Tv's, computers, but not printers or faxes. Do you have any suggestions regarding my outgoing call problem, before I return the unit. I still have about a week to work with it.